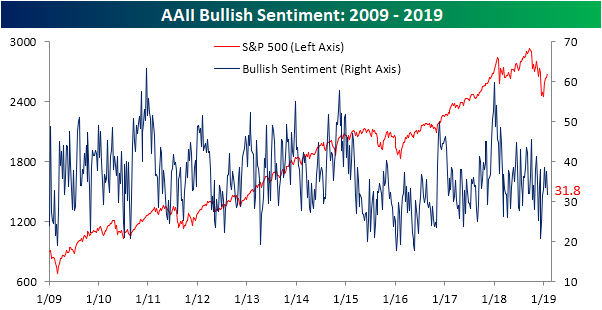 Sentiment as seen through the AAII survey of individual investors was split evenly between the bulls and bears this week. After a week of the S&P 500 largely meandering sideways—with the exception of the surge yesterday—bullish sentiment dropped to 31.76% from 37.66% the prior week. While this drop is nothing substantial, bullish sentiment still sits firmly below the historical average of 38.5%. Bearish sentiment is dead even with bullish sentiment at 31.76%. That is slightly down from 32.32% last week. Since peaking in the first week of 2019, bearish sentiment has stayed within a low to mid 30% range. This week’s reading is at the lower end of that range for this year. 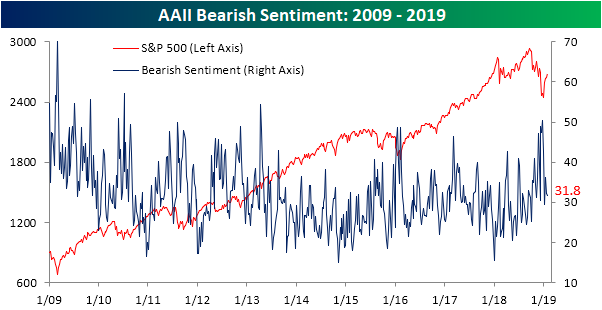 Unlike bullish sentiment and in spite of the post-Christmas rally, this is actually still slightly above the historical average for bearish sentiment. 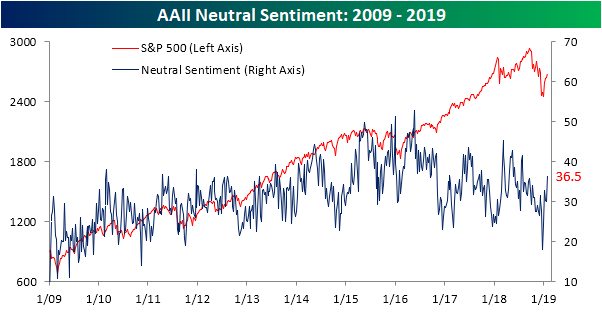 Meanwhile, neutral sentiment ticked up this week to the highest level since the first week of August of last year at 36.5%. Given these readings, investors seem to be increasingly cautious of the current rally. Although—as is the case following any Fed Day—we will have to wait until next week’s data to see the full impact of the Fed’s shift in tone and the subsequent market reaction to their meeting yesterday. The more dovish stance could help to boost bullish sentiment once again. It is also possible that neutral sentiment could drop back to more normal levels given increased clarity on the policy front.